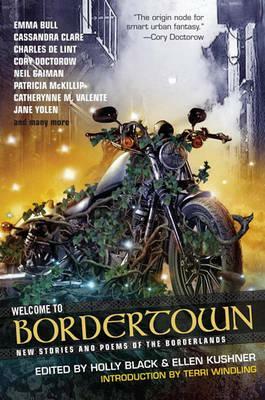 Bordertown: a city on the border between our human world and the elfin realm. Runaway teens come from both sides of the border to find adventure, to find themselves. Elves play in rock bands and race down the street on spell-powered motorbikes. Human kids recreate themselves in the squats and clubs and artists' studios of Soho. Terri Windling's original Bordertown series was the forerunner of today's urban fantasy, introducing authors that included Charles de Lint, Will Shetterly, Emma Bull, and Ellen Kushner. In this volume of all-new work (including a 15-page graphic story), the original writers are now joined by the generation that grew up dreaming of Bordertown, including acclaimed authors Holly Black, Cassandra Clare, Cory Doctorow, Neil Gaiman, Catherynne M. Valente, and many more. They all meet here on the streets of Bordertown in more than twenty new interconnected songs, poems, and stories. "From the Hardcover edition." "This is punk-rock, DIY fantasy, full of harsh reality and incandescent magic...a masterful anthology." "It's easy to be transported by each entry's rich details and compelling characters, but this page-turner's biggest success is in how veteran authors simultaneously address the themes through traditional fantasy tropes and current reality." HOLLY BLACK is the author of bestselling contemporary fantasy books for kids and teens. Some of her titles include "The Spiderwick Chronicles, " The Modern Faerie Tale series, The Good Neighbors graphic novel trilogy, and her new Curse Workers series, which begins with "White Cat." She has been a finalist for both the Mythopoeic Award and Eisner Award, and the recipient of the Andre Norton Award. ELLEN KUSHNER's award-winning novels include the "mannerpunk" cult classic "Swordspoint, The Privilege of the Sword, " and "Thomas the Rhymer." Kushner's children's story, "The Golden Dreydl: A Klezmer 'Nutcracker', " has been produced as a CD (with Shirim Klezmer Orchestra), a chapter book, and onstage by New York's Vital Theatre. She is known to national public radio audiences as the longtime host of public radio's weekly program "Sound & Spirit." She lives in New York City. "From the Hardcover edition."